The RBT Rebel Real Mouse from Quadraclicks Gaming introduces a new concept in computer mouse design. The unique "reverse activation" design is intended to reduce or eliminate Trigger Finger, one of the common RSI injuries encountered by those who engage in heavy mouse clicking. Unlike traditional mice where the optimized click force occurs at the fingertips, the RBT Rebel Real Mouse uses a "reverse" design on the buttons. This means that the fronts of the buttons where the clicks would normally be generated are actually "fixed". This permits the fingers to rest upon the end of the mouse and use this as another point of control for moving and targeting the mouse. Conventional mice do not offer this ability as the end of the mouse is dynamic and where the mouse button clicks are generated. Moving the click to the back of the buttons eliminates the "hovering" or "cocked finger" posture that is common with the usage of traditional "front click" mice. Eliminating this action can significantly decrease or eliminate the risk of developing Trigger Finger in the index finger, a common disabling and potentially painful condition where the finger wants to "lock" in place. The "reverse activation" concept moves the activation back towards the palm of hand, with the triggering action being generated by the first finger section above the palm - the metacarpals. Because the activation occurs much earlier in the finger significantly less force and movement is required, which reduces the load on the finer structures further along towards the fingertips. Because the RBT accommodates the "resting" of the fingers at the front of the buttons and eliminates the hovering action there is also potential for it to decrease the degree of Wrist Extension that is experienced with most "traditional" mice. In addition, because the fingertips are not "tapping" the buttons there is less reason for the nerves to become overly sensitized as can happen with other mice. 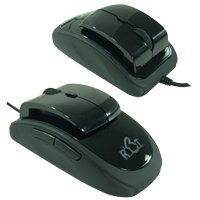 The RBT Rebel Mouse features a rubberized scroll wheel with crisp detents, 6 DPI settings (ranging from 500 - 10,800), and Back/Forward buttons above the thumb rest. It is sized to best suit small to average sized hands although those with larger hands may still be able to benefit from some of the features.